One of the things that has bugged me for a while has been the slow search. It was always quicker to search the site via google then to use the search box. I had looked at external systems and never really got far enough to implement any of them. A few days ago while reading the news page I came across an article on Sphinx by James at Mozilla Got Data? Need Search? Use Sphinx. Forums and lists that don't publicly enforce generally accepted rules of net etiquette tend to lose their more knowledgeable members. I, and I include myself in that class, have witnessed such collapses; they're not pretty. An example may be found at DigitalPoint's html/css forums. Except for a very few of us who can't resist the challenge of providing guidance, there are no authoritative voices left. Many of you donated generously to the One Laptop Foundation earlier this year, and together we purchased a couple of laptops for disadvantaged children. You may have been wondering why the donate add didn't reappear after the site upgrade. 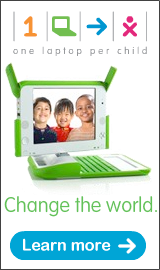 You can now donate any amount directly from the OLPC website.